As a former firefighter who arrived on campus after nearly two decades of dedicated public service, Jason Perkiser embodies some of the highest values of our community. An injury he suffered while battling a house fire in 2011 forced an early and unexpected end to his career. But it wasn’t the end of his desire to serve. A self-described terrible student in high school, he says he was lucky to find the fire service — a career he was passionate about. Not many in his family had college degrees. But he was inspired by watching his mother put herself though college and earn her bachelor’s degree. 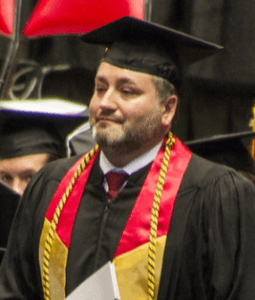 He always regretted not earning a degree, so, at age 41, he decided the time had come. Perkiser began studying history. Always drawn to the struggles of the working class, he took part in a project with history Professor Rosemary Feurer to create an interactive map tracking the history of labor strife throughout Illinois’ coal mines. The work struck a chord within him, and Perkiser plans to continue taking up the causes of labor and union issues. He graduated Dec. 13 with a bachelor of science in history and he has been accepted to law school.